I’m enjoying working on this costume so much, because it is encouraging me to learn new skills. For the mask I shaped Wonderflex for the first time. Wonderflex is a type of thermoplastic that becomes soft when heated, allowing it to be molded. It even has some bias stretch, because it is backed with a material similar to open weave buckram. When it cools it holds its shape since the plastic hardens. A lot of cosplayers use Wonderflex for armor making. 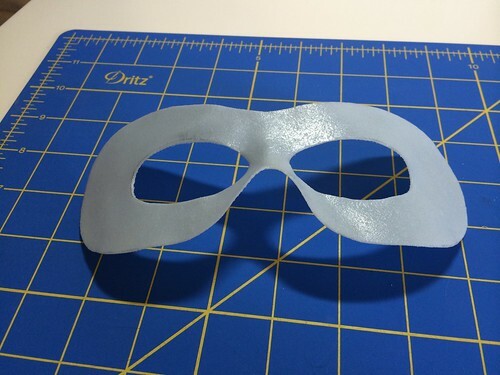 To construct this mask, I followed this tutorial written by Aigue Marine. (She has lots of helpful info on her DeviantArt account–she’s made a ton of great cosplays.) I used the first template posted here as a pattern. It worked without modification. I already had a heat gun that Mike had used in armor making before. Now I have to do the surface painting. I’m going to paint many (20?) layers of gesso on the mask, sand it down, and then paint it green. I’ve got four layers of the gesso down now. Hopefully I will have more progress soon! Haven’t tried Fosshape yet, but I hope to in the future!